The ancient Romans searched through the entrails of sacrificed animals looking for omens, and as we sat waiting for last night's show, I found myself pondering the significance, if any, of two items that were probably of no significance at all, but when you've got half an hour's wait, that's the sort of thing you do after you've had a photo taken with the Wheel in the background. Actually, we were lucky to be there at all. If The Supervisor hadn't asked what time the show started we might have rocked up at least half an hour after the actual commencement. We'd had lunch with The Sister and The Rowdy Niece, and I'd answered a question about starting time with a seven-thirty, omitting an I think and failing to note the expression of surprise from someone who's rather more au fait with the way things run over here than her sister, who has spent the last twenty-odd years in Australia. Most of the conversation was, predictably, in Japanese, so I didn't pick up the that's early for a Sunday (or words to that effect). We also learned that the ¥500 drink charge we'd complained about earlier is, in effect, standard operating practice in these parts. In any case, Madam checked at around four-thirty, we were out the door shortly thereafter and around an hour later we were seated in row G, enjoying the different ambience at a different venue. The ¥500 drink fee hadn't caused quite the same resentment now that we were aware it was par for the course, and once we were inside it was obvious that Zepp Namba is a far more relaxed environment than the Ex in Roppongi. The entrance was entirely devoid of people yelling instructions through bullhorns, and there were no PA announcements reminding us that photographs were forbidden. I joined a stream of punters getting photos taken in front of the iconic item and was on my way back to the seats when I noted a familiar-looking bearded gentleman thanking someone who'd taken a happy snap. "Strange," I thought. "Looks like Steve. must be his brother." 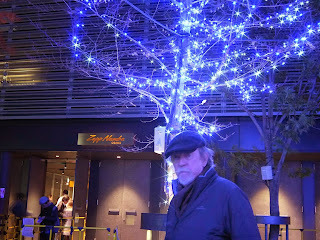 As the figure headed off I remarked on the remarkable resemblance, and Madam pointed out that he'd been stopped by a couple of Japanese girls and was signing autographs. 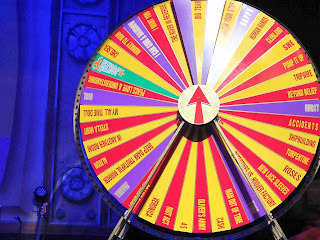 I wasn't sure why someone who'd done dozens of these shows would want a photographic record of his presence there, which raises all sorts of avenues for speculation, and it was around that point I noticed there'd been some changes on the Wheel. For a start, all the album bonuses, the King's Ransom and Imperial Chocolate and their ilk were gone, replaced by individual songs (In Another Room, River in Reverse, Big Tears, Human Hands), and what seemed to be a new Ghost Jackpot. So maybe that was it. Alternatively, if the titles up there are the result of some sort of EC-Steve-Whoever collaboration you might want a record. Or it might just be a part of the pre-concert ritual. But what was obvious from the time the ensemble hit the stage was an obvious degree of relaxation, which might be down to the fact that the TV appearance was behind them, but quite possibly related to the change of venue. As noted, Zepp Namba had a much more relaxed vibe in front of stage, and the same thing quite possibly applies to those areas we don't get to see. In any case, Elvis expressed a liking for the place. It was obvious, once the Wheel segments started, that there'd been a change in the selection policy. Elvis' first foray into the crowd produced a pair of sisters, one sporting an Elvis t-shirt and the other a Liverpool FC shirt and supporter's scarf. Obvious fans, who obviously knew how to attract the man's attention. Subsequent spinners included a couple who had She as their wedding song. That was their request, and a bit of manipulation on Elvis' part delivered the Joanna Jackpot, which, predictably, concluded with their request. The Hammer of Song segment produced a woman in a kimono who rang the bell once the right hammer had been produced and requested 45, rather than one of the obvious suspects. She sat in the Celebrity lounge, obviously having a good time and happily singing along to Radio Radio. A final crowd excursion in the Help Me extension of Watching the Detectives produced a Belgian gent in a hammer and sickle t-shirt and an attractive Japanese lass who either arrived together or were very rapidly becoming quite good friends. 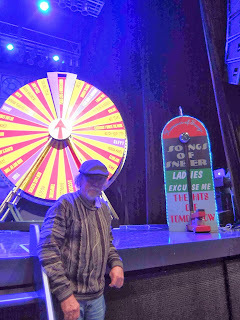 And, with the more interesting selection of spinners came an increased use of the go-go cage, though no one matched the terpsichorean tantalization of the lovely Dixie de la Fontaine. And from Row G it was interesting to watch (out of the corner of the eye, of course) what happened as The Mysterious Josephine went out into the audience. One gathers that part of her brief, in the Stage Left aisle, involves encouraging the crowd reaction. You also get the distinct impression that she has someone selected just in case. A Japanese couple spent a long time cued to go on, passed over (quite literally) in Help Me, and ended up missing their shot at the stars when the show came to a relatively premature end. Actually, it wasn't that premature, and one suspects Elvis was starting to have some vocal issues. The volume definitely seemed to have been cranked up through the latter portions of the encore in a way it hadn't been in Tokyo. He definitely seemed to be straining in Strict Time. 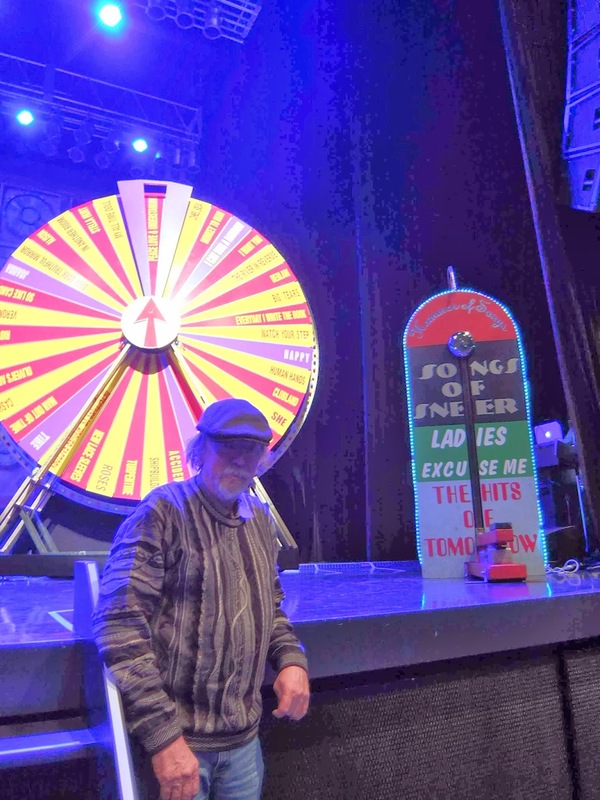 In any case, after the lengthy second set, the crowd persisted with calls for an encore, right up to the point where the stage crew started removing items from the Wheel. Elvis expressing his inner Jerry Lee Lewis when there were apparent guitar issues during Mystery Dance. My All Time Doll and Femme Fatale. New Amsterdam > You've Got To Hide Your Love Away. And, with that, it's off to Kyoto for a couple of days off bare trees in temple courtyards before we make our way back to the wilds of Northern Australia and an appointment with the same outfit in Sydney in April.